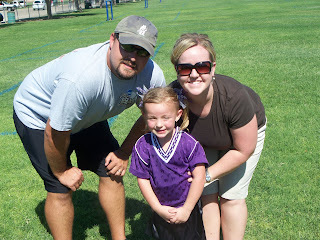 Jessilyn started her first year of soccer. She is doing really great. 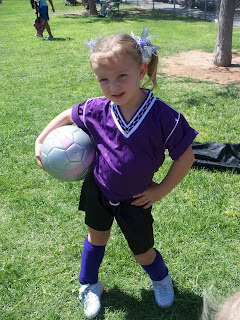 She scored the first goal of the first game. 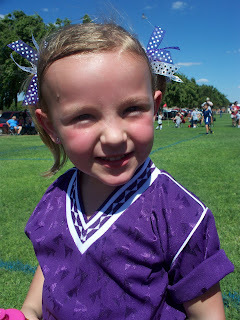 (She likes to tell everyone she scored the first goal of the season). 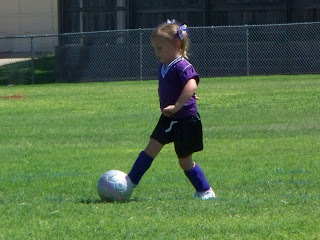 She scored two of the team's six goals at the first game, and assisted on another. The next two games haven't gone quite so well. I think at the third game we literally got beat about 40-0. (Since it is non-competitive there is no official score. Everyone wins! ha,ha I don't remember sports being like that when I played!) The other teams just seem to have a much better grasp of the game than we do, but we're slowly catching on. Jessilyn does really well, and is having a lot of fun!! She has a little friend from church on her team, and one of the other coach's daughter is also playing with us. If nothing else, it makes for some great entertainment on Saturday afternoons! On a side note...it has worked out where Randon is getting to make it to quite a few of her games. I was very nervous about how that might go, but God really blessed us with a great schedule! She worked up a sweat!! 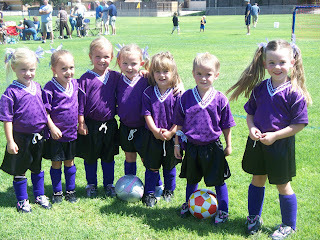 Haha, those girls are so cute in their uniforms! I think Jessilyn is the cutest though!!! !